For the past one week, the politics have hotted up. There are stories of KCR's campaign, KTR's comments, Congress party's nominations, Maha Kutami in-fighting and resignations of TRS MPs. But, where is the BJP. No one is talking about. The TRS is not even making a mention of it, while the Congress seemed to have ticked off the BJP completely. There is no news of the BJP in the media too. But, still the BJP is planning big. If all goes well, the BJP might get a helicopter for its star campaigner Swami Paripoornananda. Yes. 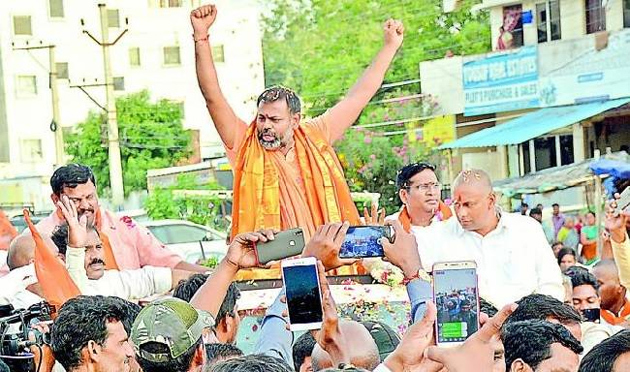 The BJP will fly Paripoornananda in a chopper for the coming 15 days so that he can address at least three to four meetings in Telangana. According to reliable sources, the BJP leaders have approached the Director General of Civil Aviation for permission to use the chopper. The chopper would cost at least Rs 5 lakh per day, but it would help the star campaigner to reach out to the people of Telangana. If everything goes as per the plan, the Swami could start using helicopters from Thursday. If that happens, he would be the only second politician in this election in Telangana to use a helicopter. But, will all these mean votes for the BJP in Telangana? Well! Even the BJP does not have a ready answer. Why Was Chandrababu-Led Front's Meeting Postponed To January? Why Are Reddys And Lambadas Leaving TRS?